What makes this a pest? PFB Larvae. Photo Credit: C. Hedstrom, ODA. Pacific flatheaded borer (Chrysobothris mali Horn) impacts a range of tree crops, including hazelnuts. Following egg hatch, young larvae burrow into the tree. Feeding activity in the cambium can lead to girdling, resulting in dieback or even death of the entire tree. Trees that do not show signs of stress following damage are more prone to breakage in future years with severe wind or heavy crop loads, because the feeding area compromises the structural integrity of the trunk. While PFB are particularly attracted to stressed young trees, they may also attack older weakened trees that are affected by blight, or that have recently experienced mechanical or herbicide damage. 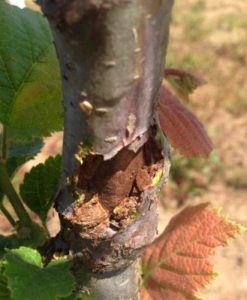 This pest is of increasing concern to growers, especially as hazelnut acreage in the Willamette Valley drastically rises. Therefore, there is potential for an increase in area wide pest pressure. avoid any herbicide and/or mechanical injury to the trunk. If area wide pest pressure increases sufficiently, it may become necessary to utilize additional controls such as insecticides. To date, there is limited information regarding the biology of PFB, particularly phenology and natural enemies. The main goals of our research are to acquire more information in both of these areas, as well as to evaluate the efficacy of several control measures, with particular emphasis on insecticides. A) Basic biology of PFB – We collected thousands of trees infested with PFB from grower orchards. After removing the canopies and roots, we capped the cut ends with paraffin wax to prevent desiccation, and placed the infested wood in field cages. 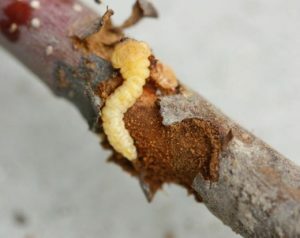 During spring 2017, several randomly selected trunks were dissected to evaluate borer development, and a weekly report was sent out to growers notifying them of insect development. 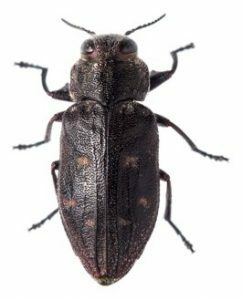 Adult beetle emergence was tracked during the summer, and growers were notified of beetle activity via email to help them determine when to spray (if they wished to do so) for optimum efficacy. PFB emergence lasted for 55 days. 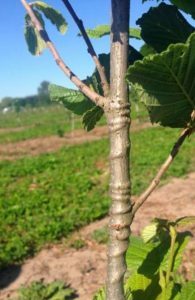 This poses a challenge to growers who wish to apply trunk sprays to protect their trees from PFB because many of the options currently registered for hazelnuts remain active for a short time period (about 14 days), and therefore must be applied multiple times in a season. Further research is needed regarding beetle development to develop a phenology model that will accurately predict growth, timing of beetle flight, and egg laying. The development of traps baited with attractive lures (another area of research we are planning on pursuing) would help estimate location specific pest pressure and flight timing. 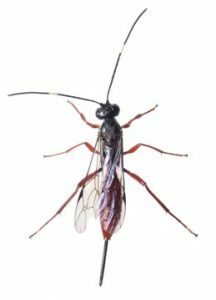 During studies of PFB development, we found ichneumonid parasitoid wasps emerging in the field cages. After being offered additional infested borer wood, we observed the wasps ovipositing (laying eggs) into the sticks, which indicates that they target immature PFB. This is a promising biocontrol agent, and additional work is needed to assess the extent of biological control. There is also a parasitic mite that has been found attacking adult beetles. C) Chemical efficacy tests – In summer 2017, young trees planted in gallon pots were treated with insecticides,and transported to two different field sites that had experienced severe PFB pressure the previous year. A third set of trees was placed in field cages containing adult PFB. To induce stress and make the trees more attractive to PFB, each gallon pot was placed into a larger pot lined with a garbage bag filled with water. The trees remained at the field sites or in the cages for two weeks. Afterwards, the trunks were inspected for early borer damage and capped with paraffin wax to prevent desiccation. Efficacy of the chemicals tested in this trial will be evaluated in summer of 2018, when adult PFB emergence can be observed.